Stromberg linkages now with kickdown! Got a Chevy or a Ford with three 97s and an auto box? You need our new 9136K Cable Throttle Bracket plus our new Stromberg TwoStep progressive carburetor linkage with auto-trans kickdown capability. What’s the secret? Our totally new center (primary) carburetor lever, which extends below the throttle shaft center line to pull the kickdown cable at a point set by the owner. The ‘kickdown’ end has a ¼”UNF thread, which accepts the special fixing common to most hot rod aftermarket auto-trans kickdown cable kits. Linkages with the new kickdown capability simply add a KD suffix to the regular part number, so the 9246PRO 3×2 kit for small block Chevy intakes becomes 9246PRO-KD with kickdown. 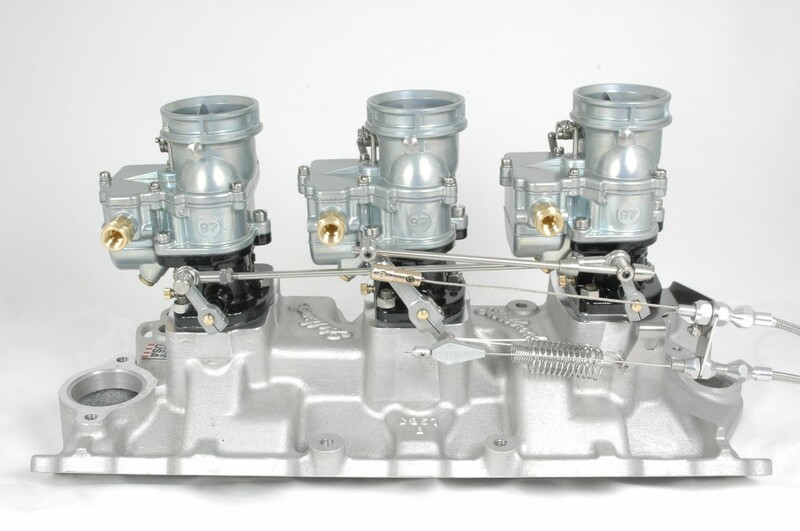 For small block Ford, choose 9253PRO-KD. Chrome versions are also available. All KD linkages come with two of our Snapback torsion-type throttle return springs, by the way. 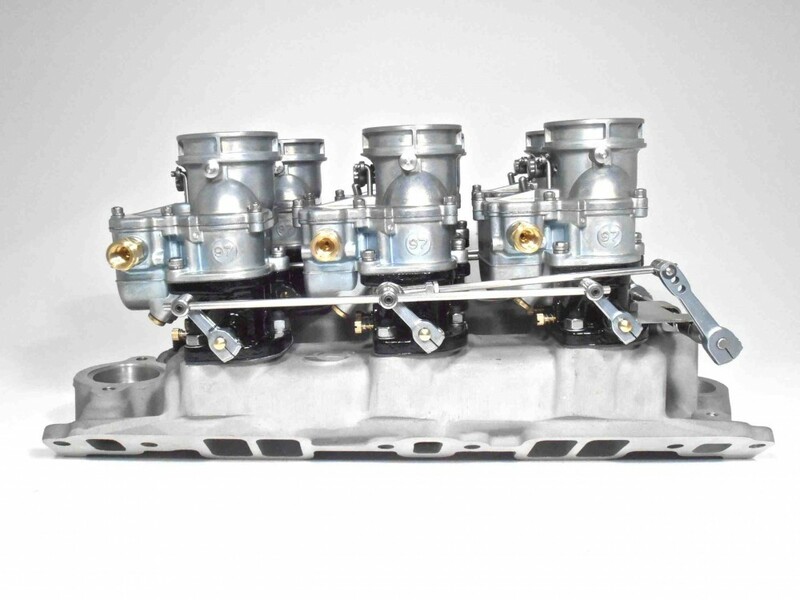 We have shown the traditional springs in our ‘assembly’ pictures to highlight a typical conversion from a Lokar-equipped 4-barrel carb to three 97s. 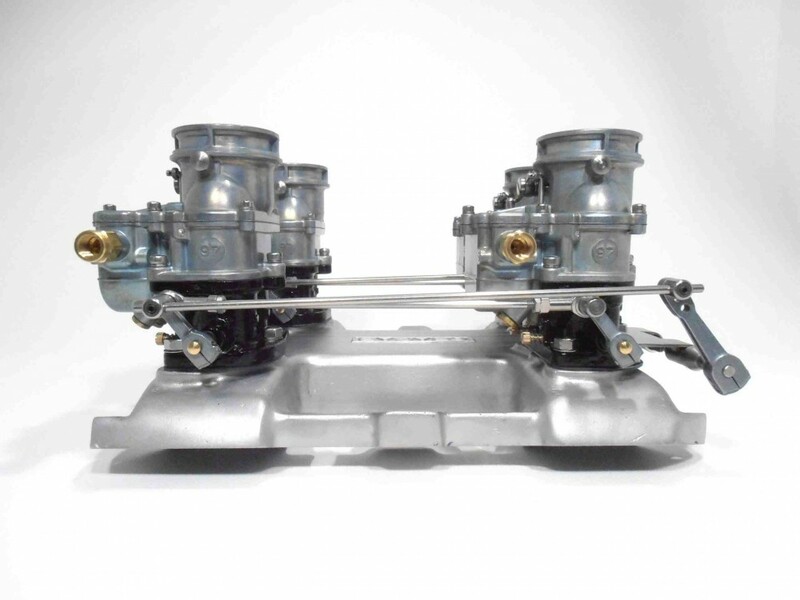 To be honest, kickdown is an issue we rarely encounter with flathead Ford applications, but with more hot rodders choosing a 97 tripower for their small block Chevy or Ford, our new ‘kick-down compatible’ progressive linkage, coupled with our new 9136K Cable Throttle Bracket, is a real problem solver. Just one note, if you have one of the more modern auto-transmissions like the 700R4, for example, please seek professional advice about the TV cable requirements. It’s not as simple as with an old-style Turbo 350, for example, as the rate of cable ‘pull’ is as important as the distance pulled. We are looking at special solutions, but they’re not ready right now. Here’s the full KD range, available from stock. The new center carb lever (Part No: 9096K-KD) is also available separately, complete with swivel and clamping screw. If you need something else, please ask! All these new Stromberg linkages are on the website under the Linkage & Fuel Delivery menu. Prices are the same as the regular linkages. And as ever, full installation instructions and ‘how-to’ help are also available at the Stromberg Tech Center at www.stromberg-97.com. 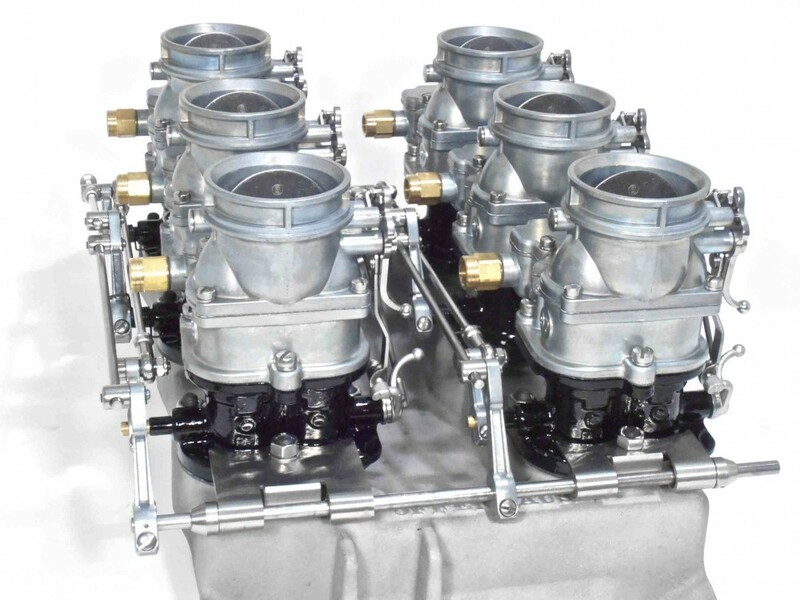 To be honest, it feels like our modular linkage kits for Stromberg 97 carburetors on Edelbrock, Offenhauser and other 4×2 and 6×2 intakes have been in development for years – and in truth they probably have. But now they’re at the warehouse ready to go. And we’re double proud of them. 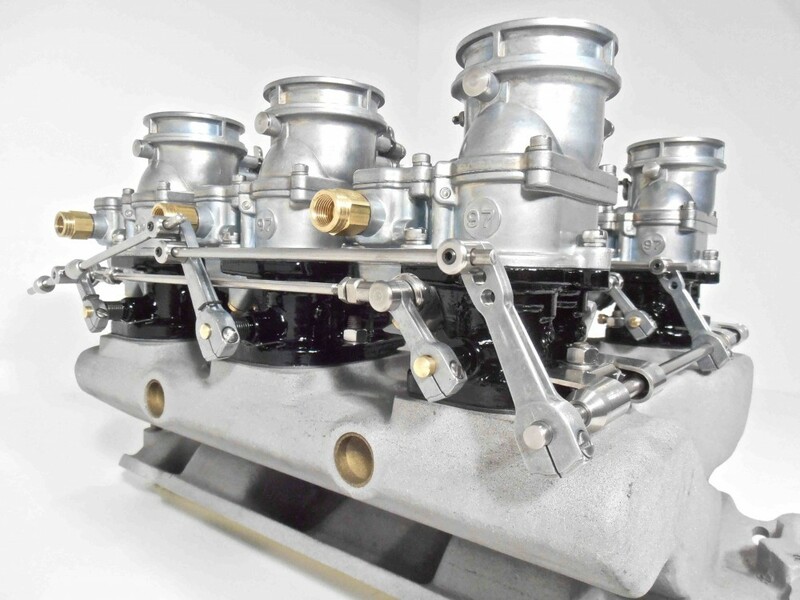 Eight new direct and progressive kits for commonly available 6×2 and 4×2 intakes, plus versatile Trim-to-Fit kits covering the full range of vintage applications. It goes without saying that they are all developed from scratch, in-house. And it was no easy task. If you want quality linkages (ie. 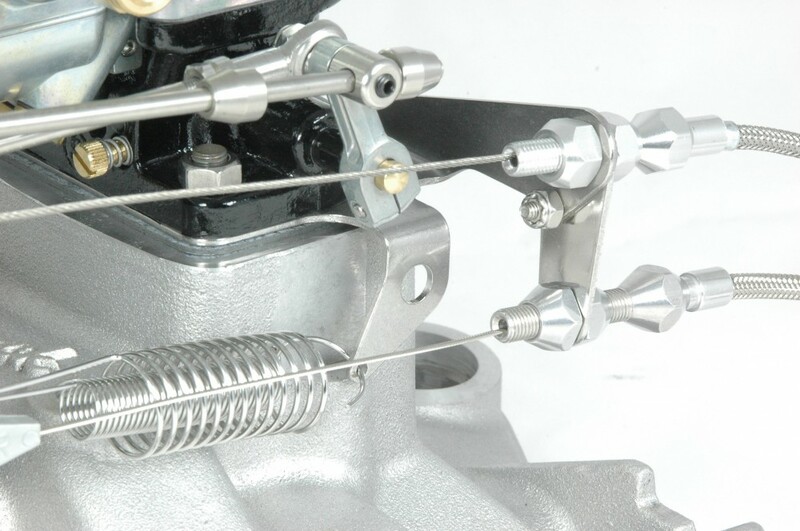 with rod ends), multi-carb linkages are a real challenge as almost every intake differs in carburetor spacing, width and the offset between the two banks. How do we cover all those bases? With tailored solutions for those intakes still available new, like the Offy Pacesetters and the Edelbrock X1 ram, plus Trim-to-Fit options, which cover pretty much everything else out there. Unlike many a linkage, ours come pre-assembled with full instructions – including ‘Trimming to Fit’. Each kit comes in a cool zinc/stainless finish but chrome and polished stainless is available to special order. So here’s the deal: The direct (non-progressive) linkages are supplied as complete kits with our Snapback return springs. 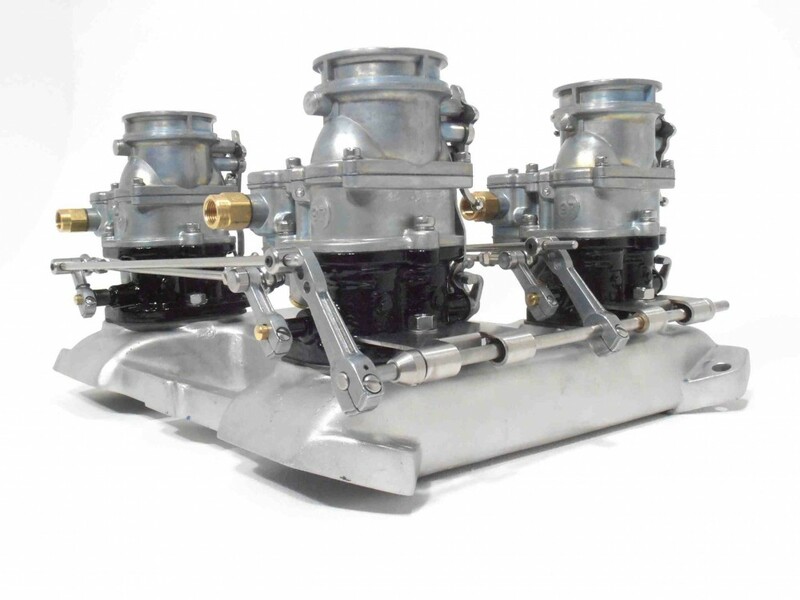 And the 6×2 progressive kits are modular, so you simply purchase two 3×2 progressive kits from our current range to suit your carb intake spacing, then add the new Back-bar Kit to link both carburetor banks together. At the heart of the new systems is our unique low-line Back-Bar brackets that won’t over-whelm your shiny new 97s. Precision rolled in stainless steel and reamed for the Oilite self-lubricating bushes, they support the Back-bar shaft at BOTH ENDS for zero flex and positive operation. You simply cannot say that if your Back-bar is supported at one end only. With so much return spring involved, the free end of the shaft flexes like crazy without full support. All our Back-bar levers are clamped AND PINNED onto the shaft. With ‘3-position’ adjustment, you can alter the leverage and throttle response, too. And our stainless Back-bar end stops prevent lateral movement. We strongly recommend a mechanical link to the pedal with any 4×2 or 6×2 system, so we’re also making our long Back-bar levers available separately as kit 9096K. Complete with swivel, clamping screw and 3/32” roll pin, they can be drilled and pinned to the Back-bar to ensure positive location and correct alignment with your pedal pull point. You don’t need to be a hot rodder to know that old is now new – or should that be news – but even the most corporate of performance companies are now opening their eyes to nostalgia overhead valve motors. 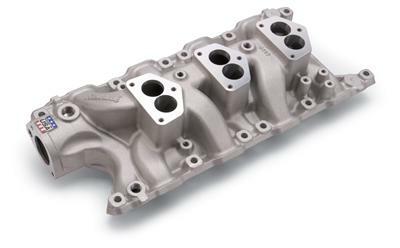 Edelbrock’s new 5412 3×2 intake for small block Ford is not just a reproduction of an old intake, but a brand new one! Click on the pics for a closer look. 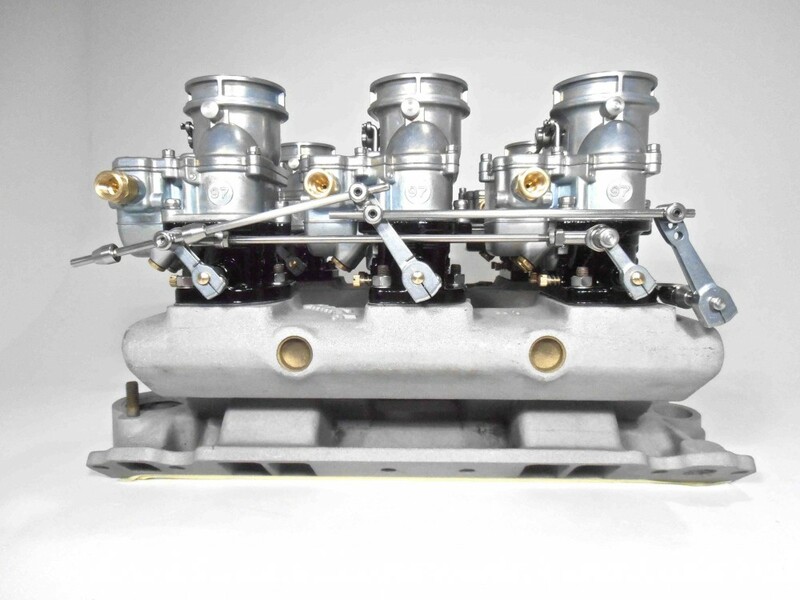 To be fair, Edelbrock and Offenhauser have made 3×2 intakes for small block Chevy available for ever. Add three new 97s and our 9246S or 9246PRO TwoStep linkage and you’re just about ready to go. But if you owned a 260, 289 or a 302 Ford and wanted a cool 3×2 intake, you were pretty much out of luck. 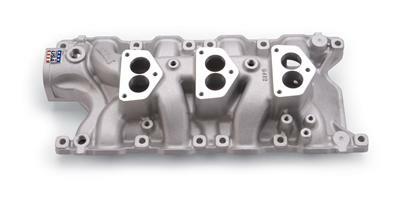 Until now, that is, as Edelbrock’s 5412 3×2 Ford intake brings 3×2 looks and power to exactly those engines. Time for a short math note. We’re often asked whether three 97s provide enough air for a small bock Ford or Chevy. Here’s the deal. Engine size (ci) x max revs divided by 3456 is the maximum air your cylinders can handle if your motor is 100% volumetrically efficient (which is unlikely). So even for the bigger Ford, 302 x 5500/3456 = 480cfm. Most engines are nearer 80% efficient at the top end (so they need just 384cfm), but even if it is 100%, three new 97s can give you 486cfm max. And remember, you only need that much air at high revs. We haven’t dyno’d this intake yet, but the Chevy 3×2 dual plane intakes pretty much flatten out at 5000rpm anyway. Remember, for most of us, it’s more about mid-range torque and drivability. There’s not a whole bunch else for us to say, except that the 5412 is claimed to be good for 5500rpm and costs just under 400 bucks. Our TwoStep 9253S (direct) and 9253PRO (progressive) linkages bolt straight on. And you can find out more at Stromberg dealer Summit Racing‘s website. As soon as we can get our hands on one, we’ll get better pics and get it on the dyno too.